Things I liked: This product is indeed all it's cracked up to be. Years ago I made my own spring compressor which worked but I always had safety concerns about it. I recently got back into airgunning and decided to rebuild my classic HW 35, and I no longer had my old compressor. I really had no need for a compressor to disassemble it, but putting a new spring in required a compressor so I ordered this. It worked great. It being clamped to the scope rails made me feel it was very safe and it was. Things I would have changed: Well a lower price would be nice, other than that, nothing I can think of. What others should know: I have read some questions expressing concern about why the white nylon knob does not rotate freely. On one hand it might be nice and help keep it from moving around on the receiver cap. On the other hand, I believe that the fact that it does not rotate encouraged me to go slow and carefully when compressing the spring and helped prevent me from going too fast and possibly cross-thread or "strip" the threads when mating the cap back to the receiver, so I'm good with that. Great tool for the shop and it does the job. Things I would have changed: It arrived with a missing set screw and the quick release button did not "pop" into place so thread engagement was questionable. I dressed the threads on the quick release and then the button popped into engagement so I felt I could trust it. I also added an additional screw near the rail end of the unit (a set screw opposing the clamping screw which squared up the clamping function) to provide a better grip on the dovetail. The original set-up was less than solid when mounted. With the additional set screw the unit mount is very solid and I was much more confident in its function. and operation. What others should know: I was uneasy using the compressor as delivered especially as I was using it on a FWB-124 which is noted for a high spring tension. After my modifications I was convinced that the unit would perform well and it did. Once modified the unit worked very well and made the job easy and actually enjoyable. Things I liked: Works great and provides a greater degree of safety compared to some of the home made compressors I have used in the past. I just used it to install and new spring and piston seal on a Beeman S1 . It worked great to hold the new spring in place while I stuck the pins in the spring plug, then I used a screw driver and an awl to "walk" the spring forward to install the pins for the trigger group, that was the tricky part, but it worked perfectly. Now my Beeman S1 shoots like brand new and can shoot through a 1" phone book like a knife through butter. Things I would have changed: The over all design is real good, the only thing I could think of would be to provide a vertical adjustment capability to help center the threaded rod on the spring plug. Things I liked: The tool worked to disassemble and reassemble by air rifle. Things I would have changed: The tool needs a bigger end. I had trouble with it walking off of the end of my action. Things I liked: Small, sturdy, well made, easy to use; grips dovetail securely. Things I would have changed: Include a handle that facilitates use. What others should know: I easily removed the factory spring in my full power Diana/RWS 350 Magnum rifle and installed a Vortek PG2 kit with the Venturi Rail Lock Spring Compressor. Worked well on my HW85, too. This spring compressor is an essential tool for those who wish to rebuild their spring-piston guns. Your first job will pay for the compressor. Read the instructions, take your time, wear eye protection. With experience, you will learn to fabricate attachments to work in conjunction with the Air Venturi compressor. Things I liked: Simplicity. I just recently used this great tool to disassemble a Beeman R10 and a Feinwerkbau 124 sport to do a total re seal and mainspring replacement. Made the job a breeze. Things I liked: I like that it works. Made it easy to tune a Hugh powered gas spring rifle. Np2 and umarex fuel. Things I would have changed: This should come with a piccatiny rail.if you plan on using it on a dovtail buy a piccatiny rail also. What others should know: This does not work well on a dove tail. The compressor rod doesn't line up correctly. Maybe on a magnum springer with a bigger air chamber but not on a gamo or titan. 5 stars but you say it does not work well on a dove tail ... ?? Things I would have changed: A few things I would change are a vertical adjustment, centers fine on 25 mm tubes, larger tubes will be off center when compressing, needs an adjustment on a vertical plane. 2nd thing is the nylon tip needs to be on a bearing so it does not rotate with the shaft, as it is you will more than likely need to guide it with your fingers when it is off center on larger tubes which leads to the next problem, and I recommend you do this BEFORE USING IT!!! The beginning of the threads on both ends of the treaded shaft are razor sharp, upon first use I sliced the heck out of my finger guiding the tip on a RWS 350 large compression tube. Take a small flat file and deburr the start of the threads on both ends or buy some bandaids, your choice. 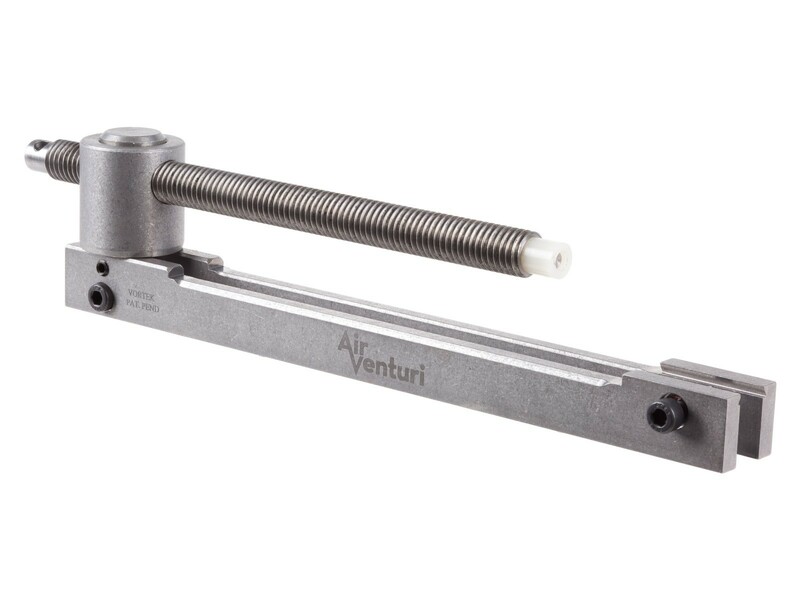 What others should know: A good tool but Air Venturi could make it better. Things I liked: I just used it to put a Vortek kit in my HW50. It clamps on the scope rail. There is a quick release button on top of the threaded shaft that releases the shaft for easy and fast use. Things I liked: Compact, easy to use, well made. Things I would have changed: It has worked well for me-I can't think of anything that would improve the item from a functional standpoint. What others should know: If you work on your springers, this makes life a lot easier. @Scott-If you have concerns about the safety of the device, you should take that up with a legal representative of Air Venturi.